Generate leads for your business, attract visitors to your event and boost downloads of your mobile app with this flexible 3-in-1 landing page template. 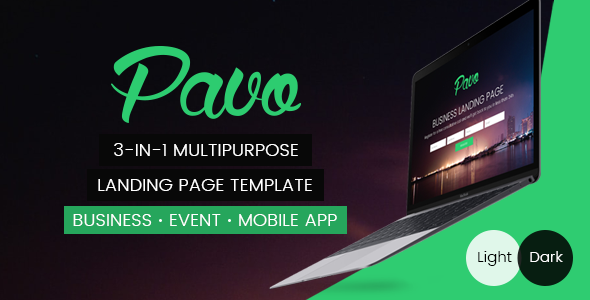 Built with the latest web technologies, frameworks and toolkits, Pavo enables you to create an efficient and elegant landing page in the shortest amount of time. Total of 6 templates: 3 variations each with Dark and Light styles. Please keep in mind that this is not a WordPress theme! It’s an HTML template that needs some basic HTML/CSS coding and graphics editing skills for customization.